The picture tells about a fairly well-known moment described in the Bible. He tells the story of Jesus himself. One man was walking in the desert and caught the robbers, who stripped and wounded him. Having finished what they wanted, they left him there to die. One person then a priest passed by the dying man, then a priest, but they just looked at the poor man and passed him without any delay. 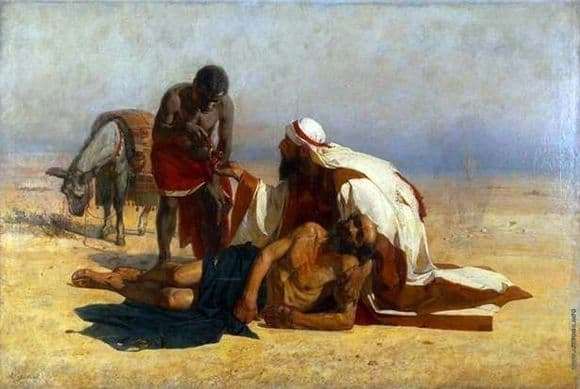 And then came the Samaritan. He did not pass by, because there is so much human in him. He did not regret any wine or oil to help the person recover. Then he took him on his donkey to the nearest hotel and gave money to shelter him. The picture is written in such a way that focuses attention only on three characters. The empty, scorched desert behind them draws no attention, like an orange-white sky, threatening with intense heat. To the horizon, the sky darkens, but it does not promise the long-awaited rain. Samaritan is dressed in white clothes, on his head there is a white keffiyeh with a red ornament. Samaritan is not sorry for white robes, he calmly holds in his arms the perishing person. The clothes are spread out and behind him in the sand. The emaciated, with his head uncovered, the man lying in front of him is held in the consciousness of his last strength. He is so thin that you can easily count all the bones in his body. In his face one can read the doom and resignation of fate. Samaritan extends his hand to a black slave, waiting for the wine or oil to pour into his palm. He genuinely wants to help. And in the distance is a loaded donkey waiting for its owners.